The ChicoBag Company mission is to reduce single-use bag waste by offering compact reusable bags and packs that are designed to be unforgettable. ChicoBag specializes in offering fashionable, environmentally friendly reusable shopping bags and lifestyle totes that are designed to be unforgettable. 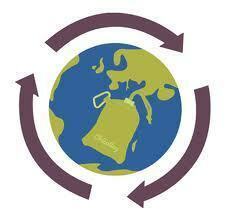 ChicoBag has been a leader in the reusable bag movement since 2005 and continues to provide solutions for every lifestyle. When I found out that I was selected to review for ChicoBag, I was very excited. First of all, I love the idea that these bags are reusable and therefore good for our environment. Secondly, ChicoBags offers the most adorable styles of bags! I had a hard time choosing which Chicobag reusable bag I wanted to review. I enlisted the help of my teenage daughter, Myelie to help me select the perfect bag. She was all too willing to help, because she knew that the bag would be HERS. 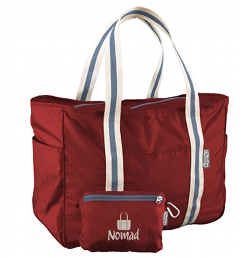 After much consideration, Myelie chose the Nomad Tote (in crimson) because this summer she is going be to traveling quite a bit, and needs a roomy tote bag. 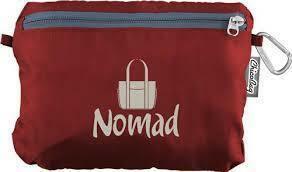 The Nomad Tote takes care of all your needs. A large capacity shoulder bag with three exterior pockets, an interior zipper pocket and room for everything but the kitchen sink! Perfect for a day at the beach, a trip to the farmer's market or a weekend getaway. The entire tote tucks down into the interior pocket when not in use for convenient storage and when its dirty, just throw it in the washing machine for carefree cleaning. The entire bag tucks down into the interior pocket, and turns into this handy little pouch! Our Experience: My daughter, Myelie was thrilled when her ChicoBag came in the mail. She had to leave for an overnight youth retreat for our church the following day. She was happy that her tote not only carried all of her clothing, but that it had extra pockets in it where she could stash her toiletries. The handles are nice and strong and the perfect length for carrying over the shoulder. It is made extremely well, and is very durable. I am very impressed with this bag, myself. Myelie loves her Nomad Tote. It is perfect for traveling, or slumber parties!